Cameron famously promised to ‘cut the deficit, not the NHS’. But NHS hospitals have seen across the board 10% cuts to the cash they get from government for treating us (around ¾ of their income). No wonder A&Es are in crisis. Government claims to have increased NHS funding frequently ignore inflation – so much so that the UK Statistics Authority told them to stop claiming to have increased expenditure. Any money the Government HAS put in has to fund the huge costs of administering the NHS 'market', not to mention paying huge PFI debts to the banks, before it gets to frontline healthcare. During the election campaign we’ve heard vigorous denials of NHS privatisation from the Tories. They’ve claimed that the amount of the NHS privatised under Labour was 5% - and it has now risen to only 6%. But these are old figures, before the impact of the Health & Social Care Act. In fact privatisation has soared by 500% in the last year, the latest figures show. David Cameron told us recently that the NHS “is in the public sector, and will stay in the public sector”. In fact, there’s a firesale going on. From ambulances to eye operations, private firms are taking cash and ‘easy’ patients from the NHS – leaving the NHS underfunded and struggling to survive. And they’re making a mess of the bits they take over, too. Controversial G4S has run into criticism of its ambulance and cleaning provision. Serco was alleged to have been providing only one GP for the whole of Cornwall’s out of hours service. Tory-donating Circle took taxpayers money then walked away from Hinchingbrooke hospital after inspectors revealed the privatised hospital was providing the worst standard of ‘caring’ anywhere in the country, with evidence of severe staff shortages, fluids out of reach, patients routinely left in soiled beds, and worse. Cameron’s lead health advisor, Nick Seddon, has advocated charging patients for GP visits. Cameron’s promised the NHS will stay ‘free at the point of need’. But the organisation that Cameron plucked Nick Seddon from, Reform, has suggested politicians could simply redefine what currently counts as ‘the NHS’ as ‘social care’ – so you could be charged for it, even as politicians claim to have kept their promises. For example, the hospital bed you recover in after an operation could be redefined as ‘hotel fees’, charged at a rate of £75 a night, the NHS Confederation (which lobbies for NHS and private providers) has suggested. Reform suggest that this can be funded by older people having to re-mortgage their homes to pay for healthcare in future. The British Medical Association recently warned that charging will be ‘inescapable’, unless we change political course. Cameron’s Health & Social Care Act abolished the government’s duty to provide us with healthcare, which had existed in some form since the NHS was created in 1948. So now, it’s much easier to deny people the healthcare they need. Ministers can now just distance themselves from ‘local decisions’ as the NHS withers and people are forced to stay in pain, or go private. Already hip operations are denied to people until they are in extreme pain, and people are being told they can only have a cataract operation or hearing aids for one eye or one ear – not both. Recently Devon went a step further, denying all routine operations to overweight people and smokers, as a cost-saving exercise. Devon was forced to partially back down – but experts say there is nothing to legally stop this happening in future, and ongoing cuts mean such plans are almost certain to raise their ugly head again. The Tories are also presiding over a roll-out of ‘Personal Health Budgets’. In social care, this system already means many people have to ‘top up’ from their own pockets – and top-ups are likely to follow in the NHS, given the Tories’ enthusiasm for ‘integrating’ health and social care. We’re already putting the charging systems in place under the guise of addressing so-called ‘health tourism’. 5. The Tories have enthusiastically adopted the plan for a further £22bn of closures – disguised as an £8bn ‘increase’. 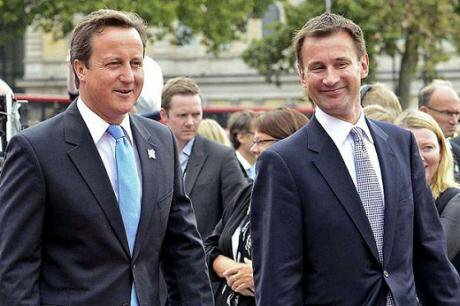 Cameron’s appointment as NHS boss (and former United Health Vice President) Simon Stevens has put together a plan for £22bn more NHS cuts, meaning politicians only have to come up with an extra £8bn to fill the NHS funding gap which Stevens admits is actually £30bn. After years of cuts, most hospitals are already deeply in the red. We already have fewer hospital beds and doctors than most other Western nations. Rather than reversing this, Stevens has plans to suggested £7.5bn could be saved by selling hospitals off, promising ‘this is only the start’. Campaigners suspect that hospital closures are being hidden til after the election – suspicions confirmed in Epsom where, having just reassured local people their hospital was safe, management consultants were overheard on a train discussing how it was to be closed. They've already made it much easier overrule local people and close hospitals by introducing the 'Hospital Closure Clause', in direct contravention of all their promises about 'no decision about me without me'. Jeremy Hunt told the pre-election Channel 4 News NHS debate that “it would be a disaster to tear up the plan”. Frankly, it’s a disaster if we don’t. Scandalously, even as hospital waiting lists rise, over £10bn a year of our money is being wasted on trying to make ‘competition’ and ‘markets’ work in the NHS – just so the health and insurance fat-cats can get a chance at running services for a profit. Every doctor and nurse in the NHS will tell you how much time they waste on paperwork so that every interaction with a patient can be priced, invoiced, and increasingly, traded. Then there’s the vast amount of time and money spent on preparing ‘bids’, and ticking quango’s boxes, just to see off the private firms hovering. The sums involved are vast – just one tender can cost taxpayers a million pounds – and there are thousands of such tenders underway or in the pipeline. The Tory leadership has failed so far to support the NHS Reinstatement Bill put forward by Professor Allyson Pollock and introduced by a cross-party alliance of Green MP Caroline Lucas and Labour and Lib Dem backbenchers, that would curtail this market waste. As political opposition to privatisation mounts, even the privatisation decisions themselves are being taken away from local health bosses and handed over to private companies – often with huge potential conflicts of interest. Virgin, which runs dozens of health facilities under the NHS logo already, has already won a new kind of ‘lead provider’ contract that enables it to secretively sub-contract elderly healthcare to whoever it likes. And other clever forms of disguised privatisation are being pushed, with Cameron’s policy right-hand man Frances Maude MP saying all hospitals should leave the NHS and become so-called ‘mutuals’ – and eight having quietly started the process already. No-one voted for all of this, last time. You’ve got today to vote for something different.